The most polemic item in the standard of the fila brasileiro is undoubtedly the colour. Along the decades there have been big discussions and sometimes irreconcilable attitudes among the breeders in Brasil and in those countries where the fila brasileiro has arrived. “There are accepted all the solid colours except the disqualify ones (white and grey, mottled or patched dogs) Stripped dogs with a solid background, can show less intensive or very dark stripes. The black mask may nor be present. In all the allowed colours there can be white spots in the feet, in the chest and on the tip of the tail; spots are not welcome in any other parts of the body. White spots in more than ¼ of the body must be penalized. “Completely white or grey dogs, mottled or patching, black or tan dogs” And among the serious misdemeanour it specifies: “white spots in more than ¼ of the total body surface. Dr. Paulo Santos says in his comments, about the item of colour, that all those colours that do not seem solid can be seriously penalized (in this group we can find not only those dogs that have washed-out colours or faded strips, but also shady colours). The first group in the straight colours goes from the light yellow (baio) until the strong red (vermelho), going through the different phases of golden. They may have the black mask or the black mask and black ears. The black mask, as we can see is not obligatory and shall not be penalized, however a dog with a black mask is always more attractive than the one who does not have it. These masks may be incomplete, it is very usual to find specimen with half a mask, which is valid as well. This group of colours has always been the largest one in our breed and actually it is still more numerous than before. Among the straight colours the next one is the grey. This colour appears in the breed since its beginning, we can find grey specimens in the most traditional breeders in Minas Gerais. It is a very looked for colour, not only for its beauty but for its shortage, as the grey gene is a recessive one. Probably, among all the fila colours this is the more mystery one relating its origins. Every time I could, I asked about the origin of the grey colour and nobody could give me an answer with secure arguments. The most interesting I heard about was, in a conversation with a traditional Brazilian breeder, when he told me that he though that the grey is only a shadow that certain dogs have on their basic colour. He thought that this shadow was a rest of the black colour. 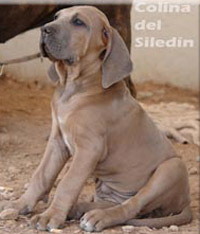 The example of the Neapolitan mastiffs could be a support of this theory as their colours are very similar to the colours of the fila brasileiro and where next to other straight and stripy colours we can find the Neapolitan grey. It seems to me a very good theory, and until we can find another based in certainties, I think it could be interesting to share it with you. This colour is also called in Minas Gerais “Jaguara grey or cinza” as the breeder Jaguara, From William F. Chalmers, is the one that made this colour popular and preserve it. Mr. Chalmers had “inherited” this colour from Pedrinho do Engenho (who had several dogs with this colour), from whom he bought his first dog, Leo da Jaguara, cinza and with bulldog shape. The grey colour could be found united to the bulldog shape. The cinza colour is really a shadow that superimposes the basic colour. Depending on the basic colour, we can fin two kinds of grey according to the Minas Gerais denomination: the silver or champagne cinza and the vinegar cinza which is darker and reddish. I think that this second one is the most frequent. 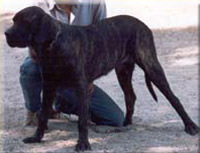 Through the Jaguara dogs, this colour reached some of the most traditional breeders in Minas, as the Jose Hamilton one, preserver of Gomez lineage, where the cinza colour has been incorporated with Maroto da Jaguara; The dogs in the breeder Rondonia, from Mr. Naves, which basis was essentially Jaguara dogs and two more breeders with a very important task in the preservation of the Jaguara line: The breeder Engenho, From Dr. Alirio Soares Barroso, who had a large number of Jaguara and Rondonia grey dogs, until the lehismaniosis killed a big part of his dogs in earlier 90s, when he started to introduce other lineage, and the breeder Tabayara, from Cristovao Giancotti, who preserves these lineages until now. 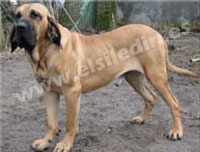 Another breeder which has, traditionally produced cinza dogs is Ibituruna, from Paulo Angotti, in Governador Valadares. I think that the cinza colour of the Ibituruna dogs has the same origin as those ones I Just talked about, as his 2 most well known cinza dogs, the female champions in CAFIB Fada and Fabula do Ibituruna were granddaughters of the male Apu dos Tabayara,property of Judge Paulo Augusto Monteiro, Vinegar cinza and Cunú dos Tabayara another male, stripy in a cinza background. 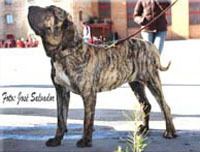 Other IIbituruna dog with a cinza colour and araca stripes that transmitted it to his descendents was Briston II do Ibituruna, and with the same lineage through his mother, Cobra do Ibituruna. Through my researches among the Ibituruna pedigrees, when the cinza colour appeared, one of these Tabayara cinza coloured dogs, or both, were part of the pedigree. Naturally in other breeders there are other cinza coloured filas, especially among the breeders that works with this lineage with more or less intensity. In Spain and the rest of Europe we can, now and then, find some cinza filas which origins are more or less the same that I commented before. At last, in the straight colours there is the polemic black. There are so many things written about this colour, that I think there is only nothing I can add to everything told thousand times. I can perhaps add my experience and my personal opinion on this matter. I think that we can accept the possibility that a long time ago there was a black dog among the filas de Brasil. If we agree with Dr. Paulo Santos theory of the upbringing of the race, we can speculate with the fact that this colour could have entered to be a part of a small number of specimen of this race by the ancient English Mastiff and the ancient Bloodhound, as centuries ago, both races had same black specimens; but I also think that if there have been filas with this colour, they become extinct long time ago. Actually, and since several years Black filas are the product of crossing (decades of the 70 and 80) with German dogo and Neapolitan mastino. This can be corroborated watching the physical characteristic of the dogs with this colour. A research made in the 70s they say that a 20% of the filas are black. I have breed numerous filas, saw lots of other litters from other breeders in Spain and in other countries, including Brasil, where several times, I asked the ancient breeders if they had, anytime, a black born dog and reading the statements of the pioneer breeders I NEVER knew that a black dog has been born in the breeders and traditional families. Supposing that a 25% of the filas are born black, I should have had a few of them at home and I should have seen a lot of them in the lineages I talked about. Joining this with the fact that all the black filas I saw had atypical signs and looked like the Neapolitan mastino or the German dogo (Dinamarqués in Brasil) I must conclude that the black colour that actually appears in the fila brasileiro is not a natural legacy, it comes from those races which whom the fila has crossbreeding with in the 70s and 80s. Respecting the stripped colours, in the fila race we can find them in a large and attractive variety. I think that this colour is the inherency of the bulldogs or prey dogs, as the stripping in the mastiff is different, it does not agree with the descriptions about the correct stripping of the standard fila brasileiro. All the basic colours (yellow, golden, red and cinza) appear in the stripped filas as a basis, where we can find stripes of varied intensity and size with irregular distribution. Well separate stripes are requirable, they must be defined and they must not join with each other as the typical English mastiff. The stripes should join in the back of the animal in a V shape every time that the stripping is dense enough (sometimes we can not see this in the araças stripped whose stripes are so short and irregular that, most times they do not reach the back of the animal or do not join in the backbone with other stripes coming from the other side of the dog). The same as with the straight colours, stripped colours may present or not black mask or years. I think that, sometimes, the text of the standard regarding the stripped colours (“striped dogs, with a solid background, can show stripes of a short intensity or very dark ones) is not misinterpreted; taking some people to think that talking about very dark stripes it means lots of stripes giving the dog a very dark colour. I think that this rule only says that the stripes may be of a dark intensive colour or they may be diffuse, resulting this way in a bald colour, what is not valuable is a fila which final colour is very dark, just because his dark stripes are very abundant and very close to each other. The white colour matter deserves a special and detailed treatment: Returning to the beginnings we find that the first dogs that were the basis of the race, had frequently white marks, and sometimes they had a white background and then spots of any typical colour of the fila brasileiro. There are numerous graphic documents showing dogs with this colour. Paulo Santos Cruz wrote in 1950 that the fila is born with all the colours, including in the list of colours more frequent in the filas, the straight white or white with coloured spots. 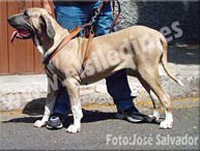 The same Dr. Santos used a white fila with stripes in his breeder; he was called Netuno de Parnapuan. Another historic dog, a basis in the formation of the race, and appearing in various pedigrees of the actual filas was Guapo do Cruzeiro do Sul, he was white with sand colour spots in the back. The filas in Europe in the years 60, 70 and even in the 80s we could often see dogs with white collars or white snout. The first official register of the race, made in 1946 (other sources says that the publication year was 1952), says in the colour item: “All the colours and their combination are allowed. In the straight colours and stripped ones white marks are frequent in chest, throat, the end of the limbs and the tip of the tail”. As we can see straight white is admitted as well as spotted and white spots in dogs with another basic colour. In the following writing, elaborate and approved in 1976 in the Brasilia Symposium, we find, in the colour item: “Excepting the completely white dogs, all the other colours and their combinations are allowed, dogs with uniform and better pigmentation colours are recommended. White spots are still accepted, but we can see that the selection is being directed to those dogs with a more uniform colour. From here we go to a third writing, in 1984, where the white is limited. It says: “All the colours may present white spots in the chest, feet and the tip of the tail”. It stays almost without any changes until the next writing in 1993, where it adds “they are not desirable in any other part of the body” and it points out “white spots that exceeds ¼ of the total body surface must be penalized”. The new revision of the standard in 2004 does not any change in this point. 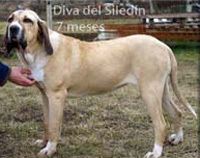 In my opinion these drastic changes were due to a very particular strategy: When the phenomenon of the crossbreeding appeared in the 70s, when the fila brasileiro was mixed up with the German dogo, the English mastiff and the Neapolitan mastino, the white spots, were reduced with of the crossbreeding, because, as I said before, they were a characteristic of the pure fila. 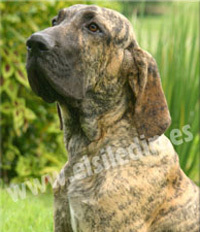 With these changes, these spots only appeared in the areas where they used to appear in the product of the crossbreeding, that was exactly where these marks are accepted in the German dogo and Neapolitan mastino, but not in the English mastiff that should have a uniform colour. This was a direct attack against the pure filas, as well as an attempt of elimination, although the official justification was that this kind of action was made in order to uniform the race. Fortunately, some of these ancient lineages were preserved by the defenders of the pure fila whom did not follow this politics of destruction of the genuine fila and we can find them today, especially in Minas Gerais, birthplace of the fila brasileiro and were the most interesting team, in my opinion, can be find. In other places of Brasil some breeders of great prestige have specimens with white spots. There are lots of breeders (more each day) that occasionally have filas with these white spots. Right now the Lineages Tabayara and Das Minas Gerais have numerous filas with a white collar (the collars may be complete, half a collar or only white spots in the neck), white snout, feet or white tip of the tail. As I said at the beginning, dogs with this kind of coloration are most valuated by the purists of the race. This seems to me a beautiful colour and I think that there is no reason to underestimate these dogs. Since a long time I have been corroborating that in this specimens we can find dogs with better skeleton and more massive, as well as very typical heads and usually very strong temperaments. It is frequent to find among the dogs with white marks, dogs with a bulldog type. I think that as in their country and among the most prestigious people with the best knowledge of this race (veteran breeders and judges of specialized in the fila brasileiro race clubs as CAFIB or UNIFILA), it does not exist any kind of discrimination until these dogs, it is exactly the other way round, here, we should strongly bet for the filas with this type of colour and try to preserve them to the future, as they are a part of the history of the original Fila Brasileiro. Briston II do Ibituruna. Color atigrado araçá con fondo ceniza. Cachorra del Canil Amparo. Atigrado correcto con fondo arena. Colina del Siledín. Color ceniza vinagre. Diva del Siledín. Color arena con marchas blancas. Iuçá II Dos Tabayara. Color ceniza plata con marcas blancas. Kalil do Ibituruna 1 año. Atigrado araçá con fondo dorado. Macho con un atigrado incorrecto demasiado oscuro y tipo con influencia de dogo alemán. Otelo del Siledín. Color rojo o vermelho con mancha blanca en pecho. Waimiri del Siledín. Atigrado correcto con fondo dorado. Waipiré del Siledín. Atigrado correcto con fondo arena. Yacaré del Siledín. Ejemplar de color dorado.